Foldable bath / dresser changing unit. Introducing Jané’s new bath changing unit, with aluminium frame which is strong, lightweight and folds up small. Flip by Jané, has an ergonomic 2 stage bath: newborn to 6 months and then 6 – 12 months. For the 1st stage, the position of backrest helps the baby to lie down, and in the 2nd stage, the child can safely and comfortably sit up in the bath. Fitted with a hand wash scoop to help the mother rinse the baby’s hair without getting shampoo in their eyes. The bath unit also features a practical drainage tube for easy emptying of the bath after use. Complete with a super padded changing mat and plenty of storage underneath for all of your changing and bathing essentials. Ideal for changing and bathing baby at a comfortable height. 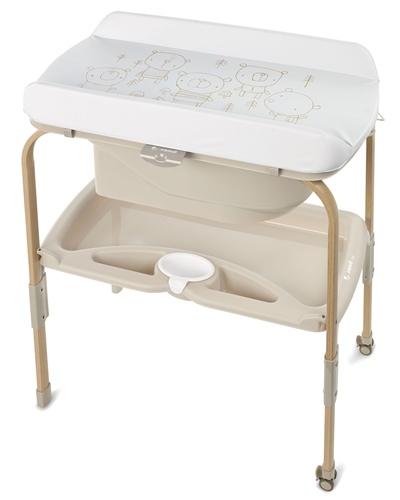 Practical folding changing station where all essentials can be stored close to hand. Strong aluminium folding frame means it folds up small when not in use. Can be installed over the bidet to save room in your bathroom. 100% aluminium frame which is extra lightweight and hardwearing. 2 Stage ergonomic bath for newborn and old baby with drainage tube so no heavy tipping required. Ergonomically designed moulds and non-slip bath materials helps prevent baby slipping around when bathing baby. Removable rigid bath unit can be used separately on the floor if preferred. Changing area has raised sides to minimise rolling. Can be opened and folded out of the way when using as a bath. Changing area: 80 x 47 cm approx.